2013 will go down in history as the year of biotech IPO frenzy, but some may also know it as the year dealmaking bounced back to fertile levels. In 2012, $109 billion was spent on biopharma and medical device M&A, with only one deal exceeding the $10 billion mark, in contrast with four in 2011. In 2013, three $10+ billion megadeals have been struck, which include Amgen’s $10.4B takeover of Onyx and Thermo Fisher’s $13.6 billion takeover of Life Technologies. Overall, pharma, biotech and medical device M&A deals have continued to outpace the global market, according to Dealogic. Whilst the global M&A scene performed only 9.3% on last year, pharma deals are up 38%. The average deal volume is 15% up on last year, with the total standing at over $141 billion. So far, there have been 225 biopharma, diagnostics and medical device deals, 14 of which exceeded the 500million+ mark in 2013. The most voluminous mega-deals of the year were in medical device and diagnostic sectors, as pharmaceutical players have opted for less pricey earlier-stage acquisitions. In terms of numbers, however, biotech has certainly outshined the rest, accounting for 76% of all Pharma, Medical and Biotech (PMB) sectors, according to a recent report by Mergermarket. Post-patent-cliff in-house R&D closures are unlocking substantial deal-ready cash for Big Pharma. After several years of pawning, re-organizing and sorting out previous acquisitions the giants entered 2013 with cash, strategy and malnourished pipelines, braced for more inorganic growth. Whilst mega-M&A activity of recent years has been filled with power play and consolidation activities, 2013 was more about pipeline acquisitions and occasional foreign market entries. 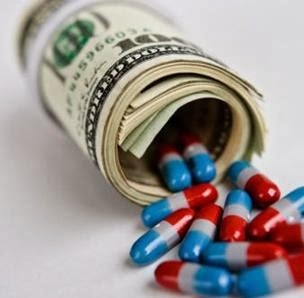 2010 and 2011 M&A landscapes were characterized by late- and marketing-stage pipelines, in line with pharma’s pressing need to compensate for immediate patent cliff losses. 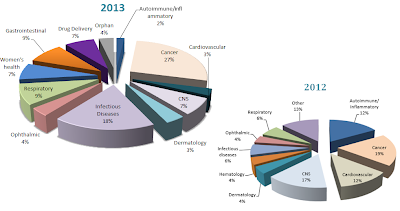 In 2012, earlier-stage shifts became apparent with 42% of acquired products in Phase II clinical trials. In 2013, Phase III products marked a nearly 10-fold comeback, whilst the number of market-stage acquisitions remained virtually unchanged from last year (Fig. 1). Early-phase and pre-clinical leads remained a popular acquisition choice in 2013. Roughly two thirds of early-stage deals included some form of approval-dependent milestones. Oncology remained the most popular acquisition area in 2013, growing in popularity nearly 35% on last year, in line with increasing global incidence (fig. 2). However, CNS disorders, which still appear to be the most lucrative therapeutic area in terms of numbers and unmet need, accounted only for 7% of acquisitions in 2013 (down 10% from 2012), following a series of loud and painful CNS trial failures in recent years. Rather than embarking on high-risk CNS trials, pharma players have this year opted for new therapeutic entrants, such as novel drug delivery systems, women’s health, and orphan specialists. In comparison with 2012, when cardiovascular leads accounted of 12% of all acquisitions, 2013 saw virtually no activity in this area, with the exception of AstraZeneca’s acquisition of the fish oil specialist Omthera. Another strong comeback was made by the infectious diseases niche, growing nearly 3-fold in 2013. For the most part, drugs in this area are targeting the unmet need for effective treatments against antibiotic resistant bacteria, particularly gram-negative bacteria. Vaccines and anti-viral agents remain highly coveted. Ophthalmic acquisitions have made a surprising comeback in recent years, due to increasing incidence of eye disorders in the world’s ageing populations. They have accounted for 4% of all acquisitions in 2012 and 2013. Of the top 28 biopharma deals shown in Table 1, 12 of the acquisitions were public companies, 15 were private and one was a divested unit. In terms of premiums paid by public companies, the average premium figure for 2013 was 37% - significantly lower than the 52% average of 2012, pushed up by the Bristol-Myers – Inhibidex 163% acquisition - the highest premium paid in five years. 2013’s highest premium was 89% in the year’s most expensive Amgen-Onyx deal, followed closely by the 88% AstraZeneca – Omthera acquisition deal. It will be interesting to watch happens to the premiums of the graduating IPO class of 2013.